"LCN's Best Performing Heavy Duty Closer - High Traffic Applications"
- Arm Option: CUSH (Cush-N-Stop Arm). - Handing: Left Hand (LH). Click here for Handing Diagram. - Delivery: The LCN 4111-CUSH-AL-LH is In Stock and available to ship. Surface mounted 4000 Series LCN closers feature a modern design engineered for each application, easy installation, and superior performance. Specially designed for rugged and institutional high traffic applications, the LCN 4110 SMOOTHEE Series parallel arm mount unit is the best performing heavy duty closer offered, and is known to endure 10 million cycles. With a variety of power coated finish options, and standard, hold open and fusible link arm options to assure this top quality product can fit your application, the 4110 series meets heavy architectural requirements, while exceeding expectations. The 4110 Series includes the LCN® "Green Dial" Spring Force Indicator. - Extra Duty Forged Steel Main Arm. - Double Heat Treated Steel Pinion. - LCN Patented Green Dial. - UL & cUL Listed. - Peel-n-Stick Templates for Fast and Accurate Installations. - Tested and certified under ANSI Standard A156.4. The 4110 Series is UL and cUL listed for self-closing doors without hold-open. Tested and certified under ANSI Standard A156.4, grade one. - Standard 4110 Series closer is shipped with Extra Duty arm, standard plastic cover, 4110-201 FIFTH SCREW SPACER and self reaming and tapping screws. - Sized cylinders adjustable for interior doors to 5'0" and exterior doors to 4'0". - Non-sized cylinder adjustable for interior doors to 4'6" and exterior doors to 3'6". 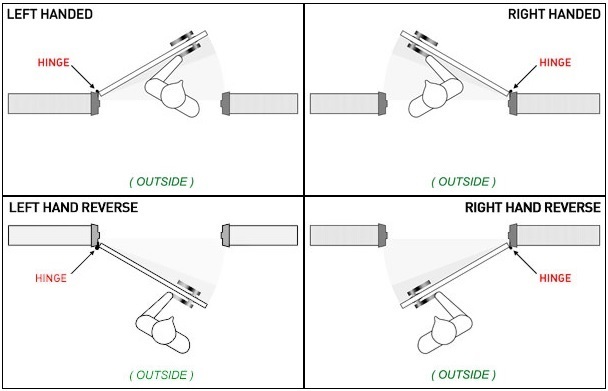 - Closer mounts parallel arm; Handed for right (RH or LHR) or left (LH or RHR) swinging doors. Click here for Handing Diagram. - 4111 cylinder meets ADA requirements. CUSH (Cush-N-Stop Arm 4110-3077CNS): Non-handed parallel arm features solid forged steel main arm and forearm with built-in stop in soffit shoe. 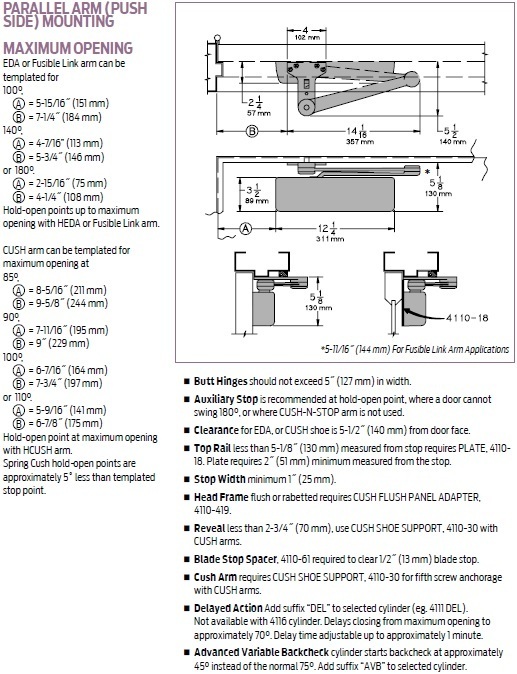 Special Order Information: For pricing on any finish or non-standard option of the LCN 4110 Series Closers not found on this page please contact Taylor Security direct via e-mail (sales@taylorsecurity.com) or call us toll-free at 1-800-676-7670.